There is nothing better than the comforting bite of a soft bun that envelops a little tower of yumminess. Burgers are our Sunday bbq treat and guilty take-away pleasure. We almost always associate them with juicy beef patties or coated chicken breasts, crunchy lettuce leaves and spicy condiments. It’s time to take burgers to the next level, have an aubergine burger. I have been experimenting with burgers a lot, having mastered the classics it leaves you with an inkling for more. More substantial than a sandwich, more sinful than delicious grills and so versatile it can accommodate any taste. The variety of ingredients is of course limited only by one’s imagination and resources at hand. I already have a favourite veggie burger, with herby chickpea patties and red onion chutney which has become a great hit with friends. The perfect solution for using up this chickpea soup leftovers. Now it’s time to bring aubergines in the spotlight. Skin the aubergines and make a pure with the mixer or cut them very thinly. Do the same with the onion and the garlic cloves. Heat up a large pan 2 spoons of olive oil in a large pan and cook them a little, then add the aubergine and the salt. Cook for 10-15 minutes, until the aubergine is a puré and well cooked. Take it off the heat and let the aubergine mix cool down. Once cooled, add the grated cheese, the egg and the bread crumbs. Mix well and let the mixture sit in the fridge for at least 30 minutes. Form the aubergine patties with your hands to the size of your buns, lightly dust with flour on both sides and cook them in a pan with a little bit of oil. It needs a couple of minutes for each side. 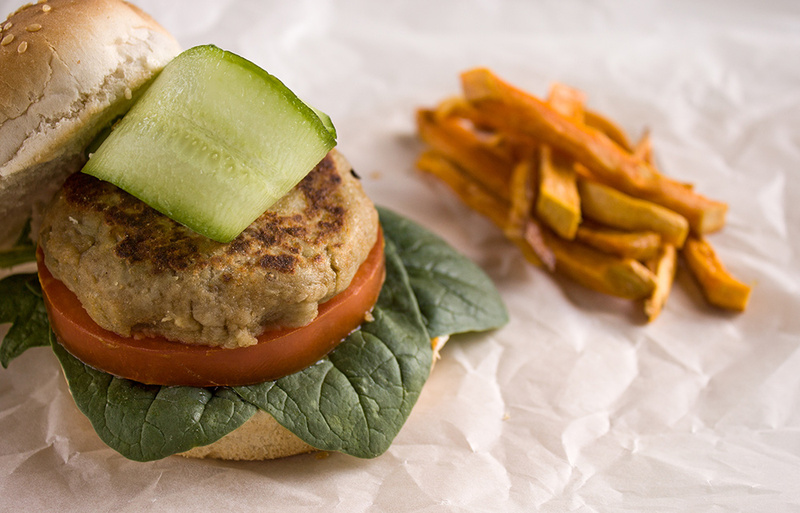 Enjoy your sweet and silky aubergine burgers with spinach leaves and a few refreshing cucumber slices. I usually have a side of sweet potato fries. I can tell you one thing: Hipsters don’t do any better than this. Looks good. I never thought about using spinach leaves on a burger–but it is a really goo idea. I love sweet potato fries. Μόλις έχθες έφτιαξα τα δικά μου μπιφτέκια μελιτζάνας μετά από πολύ καιρό και ξαναθυμήθηκα πόσο μα πόσο νόστιμα είναι!! Θα δοκιμάσω και την δική σου συνταγή Ευγενία φαίνονται φοβερά!! Love, love, love sweet potato fries (not that your burger leaves me untouched…)! I will 😀 Have a wonderful day!